1958/9 was the last season that Arsenal made it into the top four until Bertie Mee achieved this in 1968/9. Not only was Arsenal outside the elite challenging clubs, we also failed to win either the FA Cup or League Cup (which Arsenal entered for the first time in 1966.) In fact we didn’t even make it to a final until 1968. George Swindin’s opening team for the 1958/9 season consisted entirely of players who had played under Jack Crayston in the previous season, although to be fair there was one signing: Tommy Docherty who joined the side after the first game. Normally the starting XI for a season is an indicator of where a manager is going, but George Swindin liked to change his side. In the 1958/9 season there were three changes between match one and two: in came Docherty, Holton and Nutt. In 1959/60 again there were three changes between match one and two – in came Dodgin, John Barnwell (who had actually joined the club in 1956) and Haverty. Jack Kelsey has gone (he returned in October 1959). During the course of the first Swindin season in came Jackie Henderson, the re-appearance of John Barnwell, Julians, McCullough, Goy and Goulden. In 1959/60 there was one big name signing: Mel Charles. The other new comers hardly made it above the radar – John Snedden, MaGill, Dennis Clapton, and Everett. In 1960/1 Alan Skirton joined the first team, along with Vic Groves, Kane, Geoff Strong, Standen, Joe Haverty, George Eastham, Terry Neill (you’ll remember him), Young, O’Neill, Jack McClelland, Bacuzzi, and Arfon Griffiths. And the reason some of these players don’t have first names is because I am writing the first names from memory… I was there and I can’t recall some of these guys! And if you are struggling to remember some of these players then I don’t blame you, because this whole list of players is not of the calibre that we saw in the great years before and after the second world war, nor in the successful years of Bertie Mee, George Graham or Arsene Wenger. Only a few names like Eastham, Neill and Armstrong stand out. In the next few articles I will have a look at some of these players from the Swindin era. Who invented the nickname “The Gunners” and when was it first used? I remember Swindon informing an interverer that he wnted to keep Arsenal in the headlines. He did but not for the right reasons. Why did Swindon and the others fail? Lets not forget that (and dare I say this) Whittigercontributed to this lean time. It is easy to see that a player is a great player when he is showing his ability. The same with a youngster who appears to be better then rest in his class. However to the potential of a play who apears to be no better than the rest is another story and usually the sign of a potential sucessful manager. Eddie Magill was born Edward James Magill. I wasn’t around back then but I believe he was known as Eddie Magill. To confuse matters we had a player later in the 1960s called Jimmy McGill. What the Swindin Years (and others) show us is the futility, as a general rule, of appointing ex-players as Managers. Even that rarity of success didn’t last. I can’t think of a single case at Arsenal where an ex-player became a longterm successful Manager. George Graham did rather will in his 8 1/2 years as Arsenal manager & Tom Whittaker wasn’t too bad. Andy and I spent an hour in a cafe on St Pancras station debating this very point. The result of that discussion was an article on players as managers that will appear in one of the next two or three ARSENAL UNCOVERED articles in the matchday programme at Arsenal. The point is not so much players as managers, but how successful were they as players. Generally (not always, but generally) the more successful they were as players the less they were as managers. The club tried to use ex players of high quality for quite a while but after the disaster of Swindin and Wright, gave up for a while. What I find interesting is that out of the 15 managers since Chapman, no less than 12 were players of some standing or another, 2 had physio experience and 1 (Allison)was a journalist. On the basis of education, Wenger is top with two university degrees and has had the most success as manager. And one wonders whether the amateur Bernard Joy, as a schoolmaster, would have made a good manager with HIS higher education. co-ordinator and getting the best out of his subordinates. Nicky – that is how it looks. Bertie Mee, Herbert Chapman, Arsene Wenger, all modest players. Andy also argued that Tom Whittaker should be in that category too. how about the Arsenal strips,convinced the navy blue hooped socks were to associate the Arsenal with London Transport,the colours are the same as the LT roundel,by far the best strip.Bertie Mee brought it back starting with an away game at Bristol Rovers in the cup at Eastville in the late sixties. i accidentaly found this Web side regarding George Swindon’s periode as manager for Arsenal.However, before going further,allow mé to identify myself. My name is Jim Magill, Christened Edward James Magill and I had the good fortune to play under George at Arsenal. I am a little disappointed regarding the negative comments in connection with his reign at Highbury. George lived and breathed Arsenal and was always a great support and always was thère to help us when necessary.Perhaps one of the obstacles he had to deal with was his partnership with Ron Greenwood. They were both each very qualified to manage football clubs, but together as a partnership thère were just too many different opinions which very often led to a bit of confusion as to how we should play and therfore had an influence ón the results over the time George was at the helm. Jim, what an absolute honour for us to have you write to us. And of course you have a far better knowledge of what really went on than I have, as author of many of the articles here. I guess my approach is coloured by being a youngster in north London during the Swindin era, and expecting (as boys always do) that my family’s team would always win everything. Childhood memories continue, I guess. The comment you have about Ron Greenwood is one that I have picked up elsewhere, and now that I have it confirmed as a possible explanation from you, I will go back and re-write the commentary incorporating this point of view. This is one of the wonderful virtues of a blog – as we say elsewhere, this is our notepad as we try to work out ideas and approaches. Slowly as you may have seen, we turning the ideas into books – but only when the research is as complete as it is ever likely to be. Again Jim, on behalf of the AISA Arsenal History Society may I thank you for taking the trouble to write to us. Nice to read your comment. Of course results are of the greatest importance, they are what we all strive after, and what is remembered, but all too often the human side is pushed in the background. I have lived in Denmark for many years now, working as a football coach and later after taking a teacher’s degree, working as a teacher. I had the great pleasure of renewing my frendship with John Snedden just last week while driving through Germany ón my way home from Alsace in France, and I still phone my Northern Ireland friend Billy ‘Flint’ McCullough fairly regulary. I dó miss though an old boys’ network directly connected to Arsenal F.C. which would give all of us earlier Gunners a chance to renew old friendships.. Finally all the best for your webside and I am sure the good results will soon be where they belong, of course at the Emerates. re. Jim Magill wishing for an old boys’ network … Perhaps “The 100 Club” that Arsenal have just launched may be able to help with that. 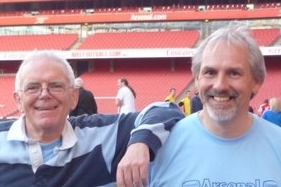 Plainly those who live far away, such as Jim, cannot easily attend the Emirates. Nice that Billy McCullough did make the launch – there posing in the front row. I remember reading the Penang newspaper about Swindin being appointed manager at GBP 3500 in the summer of 1958. It was a big sum ,bearing in mind the use of shilling and pence plus pound. I was at a stage show by the local Chinese community celebrating the Chinese month long Ghost Month.In those days there was no inter net and tv in Malaysia. I was pleasantly surprised when a neighbour told me Arsenal had you beaten Everton 6-1 with Herd netting a hattrick.If I aint wrong,Arsenal topped the standings after 6 to nine matches with 25 to 9. I believe if Arsenal had not been beset by injuries they could have won the division 1 title. Btw,Penang is famous for its food. The cha kuay teow or fried noodles costs only around 2 gbp. It tastes great and a three hour bus ride will bring you to the Thai border towns.Believe me ,you Brits will have a great time with the budget carriers with wine,woman and song. What a memory, George! Herd actually got 4 in the Everton game – and it was away. They scored 25 against 9 as you say, and it was after seven matches (Herd played in four). Before George Swindin’s arrival one reads, “This was a lethargic Arsenal side which….showed little ability to fight back” [Gunners on the Target – Geoffrey Mowbray]. Swindin, despite inheriting an average and under-strength squad (and ageing defence) from the late-Whittaker / Crayston era, seems immediately to have lifted their spirit and belief in their abilities. Just found this site and was delighted to read the entry by Jimmy Magill. I watched him regularly at Highbury and his full back partnership with Flint McCullough was a good one. Both players gave everything although the team struggled a bit at times. I think Jimmy would be a good addition to todays squad if he were a player today. I could see him tearing down the wing. Re Jimmy (Ted)Magill comments re George Swindon a similar sentiment was expressed by Mel Charles in his book and also George Armstrong,I went to secondary school in Edmonton which is a Spurs area and had to suffer the double and the stick that went with it the George swindon area in which Jimmy Magill played those players were my heroes and still are so if Jimmy ever reads this stuff somewhere on the East Coast a pensioner still claims that he was the best full back in London just as johnie Mcloud was the best winger ever seen.nice to read that Jimmy is still about. Great memories and I started at the Arsenal as a nine year old in February when we lost 4-5 to Man U. The Munich air disaster was the following week but unlike so many “Southern Softies” I stayed with my beloved Gunners.